Alright, my beloved readers, it is time to return to this year’s Commander product and shining the spotlight on those Replacement Commanders, the legendary cards that were the right colors to be in the command zone, but found the deck’s directions to not be as supportive for their abilities as the face cards of the set. For this edition, we tell Lord Windgrace, Estrid, the Masked, Aminatou, the Fateshifter and Saheeli, the Gifted to move over so we can look at the other Jund, Esper, Bant, and Izzet Replacement Commanders. 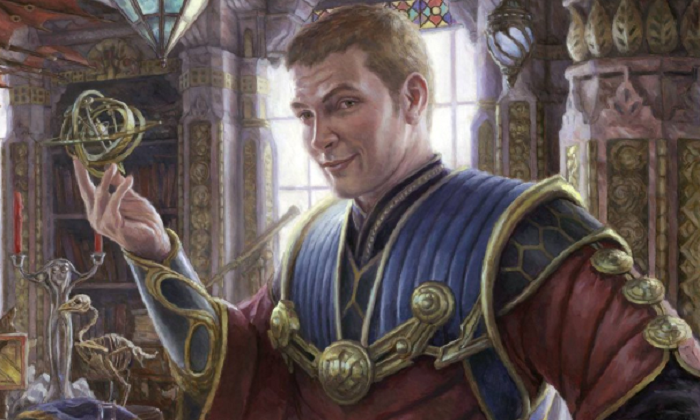 So far in this year, we have covered one legendary creature from each deck except Izzet, so it was just a toss up between everyone’s favorite new blue and red token commander, Brudiclad, Telchor Engineer and the one I am talking about today (thanks to the flip of a coin, mind you). Tawnos comes with many positive factors before we even get into his most unique ability. Sure, his power and toughness are not very impressive, but that tends not to matter in blue and red decks that are looking to win in all kinds of complicated, convoluted and downright weird ways. However, he comes with haste built-in (which is more important when you realize that his unique ability requires him to tap), only has a converted mana cost of two, and he is an actual Artificer. 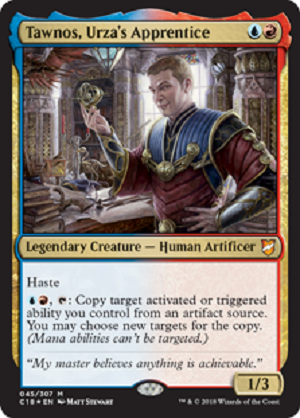 For anyone who knows me, I have always argued against another recently-printed Izzet legendary creature being the top “Artificer” when her ability is not specifically about artifacts (Jhoira, Weatherlight Captain). But starting wars over who is and is not a great artifact commander aside, I do appreciate how Tawnos’ ability is worded. During the Commander 2018 preview season, seeing him instantly reminded me (and probably most of you) of Rings of Brighthearth, with some small differences. For one, Tawnos needs to tap to use his ability, but he also can hit triggered abilities instead of just activated. So, he is almost a mix of Rings with Strionic Resonator, which is an interesting concept to build around. I want to take a quick second to highlight something that you, the readers, may notice as you continue with this article. For the past year, I have written all my series by coming up with multiple strategies and therefore, multiple different decklists. While this is tons of fun most times, I have found that I simply cannot maintain building that many decks on top of brewing decks for my YouTube channel, Twitch streams and then brewing with people who win the Twitch giveaways, etc. I am slowly (well, maybe not that slowly) starting to burn out on deck brewing energy, so moving forward, I must make a change for these articles. I am going to be building a single deck, trying to have a few strategies well (but loosely) represented in the decklist, like how the Commander product precon decks are built. I hope everyone can understand the need for the change and I still hope everyone continues to enjoy the articles with this change. I thank everyone for their patience and understanding! It is important to note that for the first three articles of this series, I wrote them so far in advance that EDHREC.com did not pull data for those legendary creatures yet. Now that we are catching up to real time, I do have EDHREC as a resource. This is great news for me for Tawnos, since Izzet combos are not my strongest playstyle and it should be great news for you readers because hopefully using the site will make me seem less dumb than I really am! News flash! Paradox Engine is a potent card in Magic: the Gathering and if our opponents do not remove it, we are probably going to combo off and win the game! I point this out because Tawnos can copy the Engine’s triggered ability so we get double untaps. We tap our mana rocks (of which we will run quite a few) in between and net tons of mana. Then, of course, if we are netting enough blue and red mana, Tawnos will be untapped again from Engine as well and we can just keep doing crazy plays. I also like the idea of having Aetherflux Reservoir in the deck so we can pay fifty life to shoot two targets for fifty damage. For the record, paying life is part of the activation cost, which is why we do not have to pay it twice. These should be the two main ways we end the game, with quite a few cards invested into finding, casting, protecting and recurring these cards as much as possible. I mentioned above that we want to “find” the Engine and close out the game. Depending on who you ask, this can mean two different things. Some people will simply try to draw enough cards to find the key piece of the strategy and there is nothing wrong with that. With a deck that runs Paradox Engine, having more spells to cast so we can untap and keep going is exactly what we want to do. Cards like Blue Sun’s Zenith and even One with the Machine will do exactly that. We can also dig into our library with a new card from Commander 2018, Saheeli’s Directive. As this list continues to take hold, I noticed that there are a plethora of artifact cards, so throwing in Jhoira, Weatherlight Captain should also fuel the fire of our plans. In addition to drawing cards, we can simply go looking via tutor cards, so Whir of Invention, using our artifacts to Improvise, the artifact-based version of Convoke. 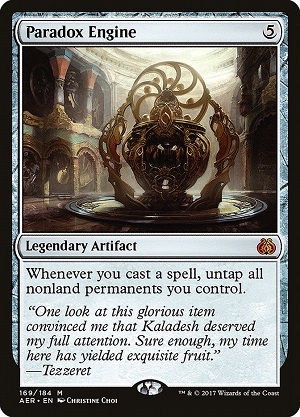 Kuldotha Forgemaster is a great tutor because Tawnos can copy the ability without having to sacrifice three more artifacts and we can grab both Engine and our friend the Fish Bowl. Another card and ability Tawnos can copy is ironically from the same plane as both of our wincons, Planar Bridge. The best part of Bridge is that if we have enough mana rocks and can trigger Engine after it is on the battlefield, that is basically the time we start going off and bringing the game to a close! Utility lands are very important in the Commander format, so Inventors’ Fair is a nice fit in the list. As a final note, I also like the idea of running Tezzeret the Seeker, who can tutor Aetherflux Reservoir immediately, while grabbing Paradox Engine after activating his plus ability the first turn he comes down. Personally, I play Magic with the same group of ten to twenty people via the Praetor Magic discord server and on the team’s Twitch stream. Shameless plug aside, my point is that I have a meta of players that know me and what I like to do in the game. For the most part, Commander seems to be similar for many other players; we all know what our friends like to play and how they like to push the game to a conclusion. I make this point because the more you play with the same people, especially using the same deck, the more they know what to look for to stop you. If Paradox Engine and-slash-or Aetherflux Reservoir hit the field and we cannot close out the game, the only logical response the table is going to have is to pour as many resources as they can manage into getting rid of both pieces. This means we need to invest some card slots into protecting them. The obvious answers are cards like Darksteel Forge and Padeem, Consul of Innovation. I like the idea of Slobad, Goblin Tinkerer as another layer of redundancy. If we cannot stop the table from sending our artifacts to the graveyard, another option is to bring them back out. 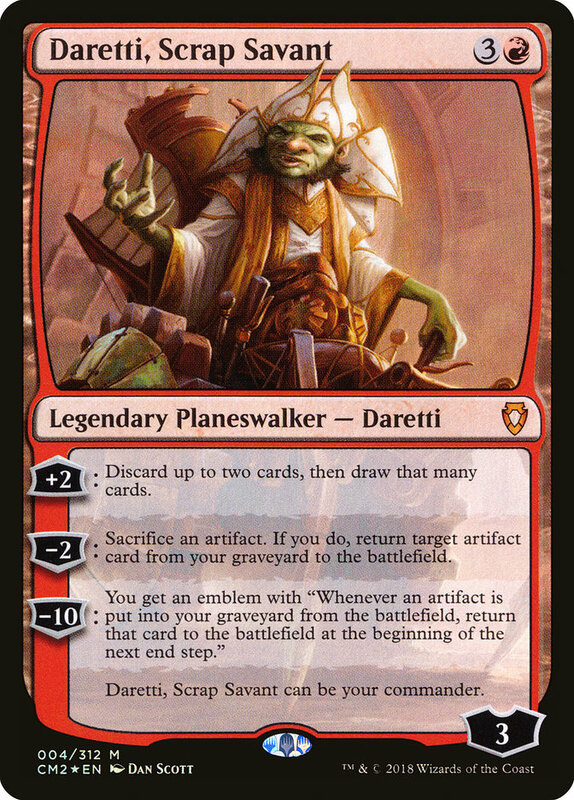 Trading Post is a go-to artifact recursion piece and we cannot forget that no one is ready for Daretti, Scrap Savant. Pair Daretti with Myr Retriever and Junk Diver and we can recover from losing both of our key pieces in the same turn! The overall point to this series is to construct decklists that feel like they could work in the annual Commander product. One thing that Wizards of the Coast does very well every year is ensuring the decks have support cards. What I mean by “support cards” is the miscellaneous cards that may have nothing to do with the deck’s theme, but they help make the theme happen consistently. Our card draw, mana ramp and removal or battlefield wrath effects all fall into this category, the answers we need to deal with situations when our opponents pull ahead of us or play something problematic. I always enjoy when Wizards throws in cards that fill a category while still relating back to the theme of the deck. With this being an artifact dominant deck, we talked about One with the Machine for drawing cards and this is exactly what I mean by relating back into the theme. Burnished Hart and Solemn Simulacrum are cards that most Commander decks benefit from, but they seem to work even smoother with the kind of recursion this deck is running. The same goes for Hedron Archive and Dreamstone Hedron. Both Unstable Obelisk and Spine of Ish Sah work as removal, with Spine doubling as sacrifice fodder for the aforementioned Kuldotha Forgemaster and Slobad, Goblin Tinkerer’s activated abilities. 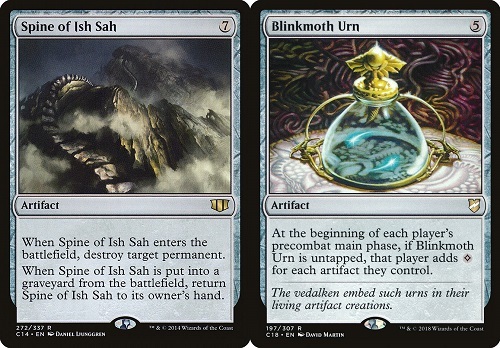 Of course, if we want ramp in an artifact deck, look no further than Blinkmoth Urn! It is also important that we notice how Tawnos can copy all of the activated and triggered effects of all the cards we just looked at. Double the value, double the fun! NOTE: I avoided putting certain cards into the list. Mycosynth Lattice seemed too mean with running Darksteel Forge and Vandalblast, while Isochron Scepter seemed like too much of a “win more” card in a deck already based around Paradox Engine and Aetherflux Reservoir. I also omitted the artifact lands (Great Furnace, Seat of the Synod and Darksteel Citadel) since they did not untap with Engine and Tawnos cannot copy their abilities. There we have it, a deck built to truly take advantage of what Tawnos, Urza’s Apprentice can do! I am truly unsure about this new format, since I have been working all my articles on EDHREC.com the same way for over a year now. I appreciate any criticism on the formatting of the article down below, as well as your thoughts on the deck and the cards chosen. Of course, if you want to talk even more Magic: the Gathering with me and get in a few games on Magic Online, feel free to follow me on Twitter and join my Praetor Magic Discord server! When Uncommonders returns, doing both of those things will allow you to help me decide which uncommon legendary creatures to talk about in that series, as well! I hope you enjoyed the article and I look forward to hitting the second set of Replacement Commanders in the coming four articles! Until next time, keep brewing and keep having fun!